Expedition 56 Commander Drew Festal (right) and Flight Engineer Ricky Arnold (left) of NASA, along with Flight Engineer and Soyuz Commander Oleg Artemyev of Roscosmos (center) will return to Earth on Oct. 4, after 197 days in space. Three of the astronauts aboard the International Space Station, including two NASA astronauts, are scheduled to return to Earth on Thursday, Oct. 4. NASA Television and the agency’s website will provide complete coverage of their departure from the station and landing back on Earth. Expedition 56 Commander Drew Feustel and Flight Engineer Ricky Arnold of NASA, along with Flight Engineer and Soyuz Commander Oleg Artemyev of the Russian space agency Roscosmos, will close the hatch to their Soyuz MS-08 spacecraft and undock from the station’s Poisk module, heading for a parachute-assisted landing on the steppe of Kazakhstan, southeast of the remote town of Dzhezkazgan a little more than three hours later. 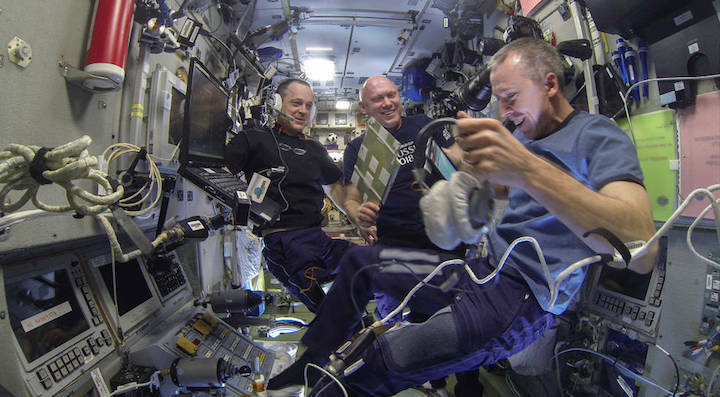 The crew is completing a 197-day mission spanning 3,152 orbits of Earth and a journey of 83.4 million miles. During their time on the orbiting laboratory, the crew of Expedition 56 carried out science experiments ranging from physics to biological studies and conducted tests to expand navigation capabilities in preparation for future travel far from Earth. They also participated in NASA’s Year of Education on Station, which links students on Earth directly to astronauts aboard the space station. After landing, the crew will return by helicopter to the recovery staging city in Karaganda, Kazakhstan, where they will go their separate ways. Feustel and Arnold will board a NASA plane and fly back to Houston, while Artemyev will return to his home in Star City, Russia.